Louis van Gaal was rewarded with a fantastic birthday gift by an opposing player, Kyle Walker in the lunchtime kick off of the BPL, having last won on his birthday 22years ago, Van Gaal handed debuts from the start to Serge Romero, Mart Darmian Memphis Depay and Morgan Schniederlin. The decision to drop David DeGea came as a huge surprise hours before the game fueling speculations he could still head to the Bernabeu this summer, Romero however was faultless in a decent debut. 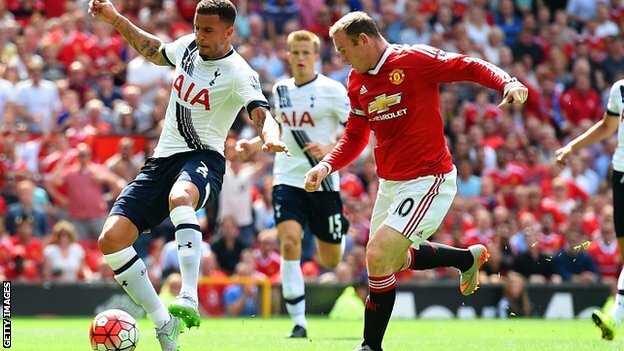 Spurs started firing and Romero was forced to action twice early on as Ericsen flashed wide and Walker tested him, against the run of play in the 22nd minute; Ashley Young's cross was met by the on rushing Kyle Walker who intercepted before Rooney could pounce albeit into his own net, the goal became the winner in a game few chances. The own goal knocked the stuff out of the visitors as United gained momentum and threatened with crosses from Young and Rooney, Harry Kane's header was blocked late on the half and Romero saved again at the stroke of halftime. The second half started slowly and Schweinstagger was handed a debut as he replaced Michael Carrick in the 62nd minute shortly after Spurs had taken off Bentaleb for Mason, Depay's debut ended in the 68th minute as he was replaced by Ander Herrera, Pochetino threw in Eric Lamela at about the same time to replace Moussa Dembele. Sergio Romero was the stand out performer in goal for United as his timing and alertness kept the score line at 1:0... Is that goodbye to the Spanish prince?